The Current Cost Change Report is designed to update automatically using the Windows Scheduled Tasks utility. It is a Visual FoxPro application. Upon opening, the user can intervene to stop the update if so desired. 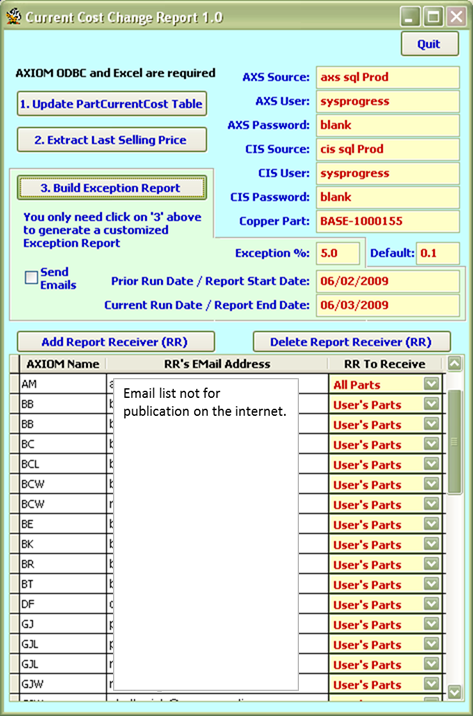 Reports are generated and emailed automatically to the part owners (product managers in the case of finished products, product engineers in the case of WIPs, purchasing agents in the case of raw materials). Each manager receives a report on only his or her parts.